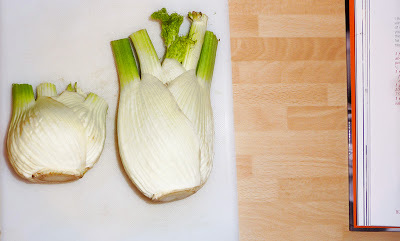 Did you know that there were male and female fennel bulbs? The males are flatter and the female bulbs are fatter and have more flavour. So you should choose the females. You may have already known this but to me this was some sort of miraculous revelation, because it will change the way I shop for life. Well for fennel anyway. Look, I even bought a male and female to test and you know what? They were right! Priceless little nuggets of pure gold like this are scattered around The Eagle Cookbook, facts about the region the dish is from, specific ingredients, seasonal information, technical cooking information where necessary, where to spend your money and when not to be silly. Each recipe is briefly introduced with either something useful or interesting. 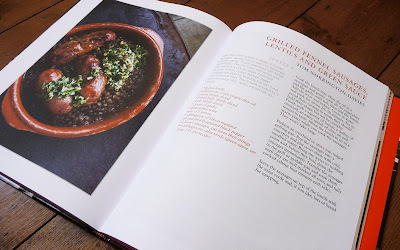 Most cookbooks do this to some extent but I’ve never come across such useful information delivered as if it were bellowed across the kitchen floor during a busy service from a passionate and helpful chef. Actually, the tone of voice throughout this book is very politely matter of fact. No flouncing or pouncing, no ego, just incredibly well written with a refreshing get-in-the-kitchen gusto. I want to cook everything in this. The ingredients sing to me; chorizo, truffles, lemons, peas, chilli, artichoke and dishes that make me drool like belly pork stew with peas and saffron, asturian pork and butter beans, egg fettucini with ricotta, peas and smoked pancetta. Big, big flavours that are sensibly executed. This is not a cookbook to gather dust on the shelf or for special occasion use. Most of the recipes deliver everyday luxury for people who value a decent meal at the end of the day. The first thing I cooked from it was the simple Spaghetti with Roasted Fennel, Lemon and Chilli, using, as they recommend and I also champion, the De Cecco brand of pasta (eyes rolling everywhere… yes, I know I bang on about it but seriously, life is too short for tosh pasta). I really loved it. 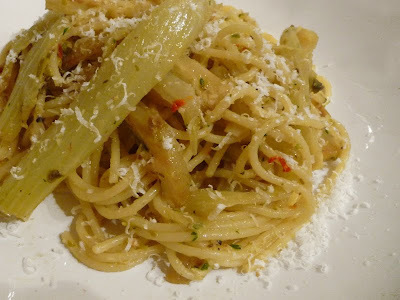 Really zingy lemon and capers, softened by the fennel and then brought back up with a chilli pinch. A pasta dish and a half. Recipes are sectioned into soups, salads, meals on toast, eggs for dinner, pasta, rice, fish, meat and side dishes. It may be worth mentioning that there are no desserts in this book, but who cares? I don't, just give me another serving of that spaghetti for afters. The design of the book is spot on. Clear, well considered typography and brought to life with well-seasoned, smoky pub colours and atmospheric photography. The food photography itself does the dishes justice without over hamming the styling. No strategically placed cutlery here. The Eagle was apparently the first gastropub on the scene in 1991 in Farringdon, the result of a cheap lease deal and the keen eyes of Micheal Belben and David Eyre. 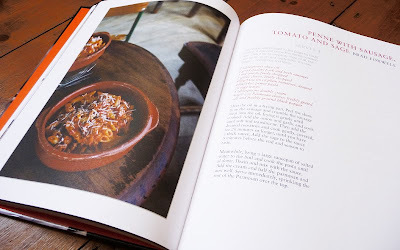 The Eagle Cookbook is a totally redesigned and updated edition of their popular 2000 book, Big Flavours and Rough Edges (now out of print? ), to reflect the influence of the chefs working there since. Should you buy this book? If the ingredients mentioned talk your language, I’d say so. My copy is currently on my bedside table. As for more pubs serving food like this, well I’ll raise a pint to that. Thanks to Absolute Press for providing me with this copy for reviewing.